Very nice article Jason. With new features added every month, all the articles around power bi vs tableau are obsolete as their pain points of power bi are no longer relevant. This article is the most updated comparison if anyone has to take a look right now. Your points on TCO are very relevant and I had to explain the same that the article has lot of assumptions and conditions which are no longer valid. so glad you mentioned the TCO paper published last year… that thing was a joke. Another difference it is worth to mention is data modeling. Power BI allows table with different granularities that are necessary to compare sales Vs purchases Vs budget. It also handles many-to-many relationships. Tableau has supported blending of data at different granularities since version 6 (released October 2010). There is so much great info in your article (especially the pricing comparisons). This is one of the most accurate articles on the subject that I have read for a long time, thanks for writing. There is a big issue with your point on the speed at which MSFT are adding features though. They seem to be in a race to complete a giant checklist (some say they are copying Tableau, but that’s their prerogative), and whilst they are chasing this feature list, they are not implementing each feature carefully. This is creating something of a Frankenstein product imo. Take ‘hierarchical axis’ for example. A feature implemented in the November release to compensate for Power BIs inability to display two dimensions side by side. This feature has only been added to two of the many charts available (and if course, to none of the custom visuals). It has also been added as a strange formatting option which is pretty hard to find. My ‘fag packet’ estimates are that MSFT have completed about 1% if the coding necessary to make this feature comparable to the same feature in Tableau. I might be wrong, but can come up with at least twenty significant sub-features that ‘hierarchical axis’ is missing. I think this helps explain the pace at which features are released. First of all, let me just say this before I reply – big fan of the work that you guys do as well as some of your folks, very talented group! Absolutely appreciate the contributions of your group to the world of dataviz. 2) and also, gives the same existing features that people are used to and love in the market leader. Also, it is not just Power BI copying Tableau, the reverse is also happening. Some say Project Maestro is a response to Power BI’s data preparation capabilities, just the same way they say the acquisition of ClearGraph is a response to the NLP capabilities in Power BI, but that’s their prerogative. Companies have to reach to the market, else they will be the next Blackberry or Nokia. Again, no shame in admitting to it or doing it, imo. Coming to the “Frankenstein product” comment, I feel that is a bit far-stretched and I feel that some of the features are really well integrated. However, you do make a good point on the “1% coding necessary to make this feature comparable”. My understanding from my limited interaction with the Power BI product group is – Pareto’s rule – they are prioritizing on the 20% which will help in doing 80% of the work, and once it is out, more features will be added to get it to 100% over time. Imo, this is a very pragmatic approach. You also mention that MSFT added ‘report in tooltip’… strangely two months after Tableau did. I haven’t tested this, but already see issues relating to this being half baked. See this from the power bi forum for example. This feature took Tableau 3 years or more to implement. They really care how features are implemented, and are not chasing a checklist. As I said in the previous comment, the release strategies of the two companies are different – one is more agile while the other banks on the traditional approach. There are advantages and disadvantages on both approaches. For eg, when you are more agile, it means you can add more features quickly and react faster to the market reception. However, it comes at the cost of stability (as you have to be extra careful that the new features don’t break anything else in the existing code) and also at features not being 100%. This is the general direction the entire BI industry is taking, you don’t have projects that span months or years now and everyone wants to see faster results. Also, Power BI report Server only releases once in 4 months and does not include the Preview features, which would be a better comparison the updates happening in Tableau Server. In Power BI, they release features in the Preview mode first, which means that organizations have a choice to include/exclude it if needed. And you are right, Report Tooltips is in preview mode currently, and will not work in Publish to Web. But you as a customer is offered a choice here – you can either wait till it goes GA or use it now in your enterprise reporting. As a customer, I prefer to have a choice rather than wait for god knows how long. Also, you have features going GA pretty quickly most of the times. Take the example of Bookmarks, the response to Storytelling functionality in Tableau. It wen GA in a couple of months and has more features than the Tableau equivalent. And this is another reason why I don’t want to nitpick features, because for every one feature you can point out in Tableau, I could maybe point out 5 in Power BI that Tableau can’t do. But that does not make one a better tool than the other. What matters is – as an end user, are you able to get from your data to insights to action quickly and with little effort? Aside from licensing differences, it’s relevant to note that Powerbi has no OSX client while Tableau does. This is a great article and addresses most of the topics. I feel Power BI is evolving rapidly and soon many of the limitations will be taken care of. Embedded analytics doesn’t give a per user personalized experience in the App owns data version as the roles in Power BI are not centralized but are at a dataset level. This might push towards using Azure ADFS or an IDP as an Authentication mechanism which would increase the cost of the solution and number of places to administer. 2) Content subscription: While this feature works really good if you already have Office365 mail subscription or Microsoft exchange subscription (mail forwarding), I look at this as additional cost. It’s surprising to me that PowerBI doesn’t currently allow connecting to more than one dataset published to the service. This would increase the dependency on IT or a need for lot of anticipation when desigining datasets. There are other features like exporting to a PDF or simpler administration capability or simpler security features that would be great to have but are more of a comfort. The bottom line is Power BI works great if you already have Microsoft infrastructure in place and would even reduce the costs for BI solution. But if you do not have other Microsoft products then it would probably end up costing close to some of the mature players in the space like Tableau. 1) You can give a per user experience with RLS combined with Power BI Embedded. And this does not push towards ADFS / IDP and should not increase cost or administration. Would be more than happy to discuss and tell you how through an email. 3) Power BI can connect to multiple data sources and that is called a dataset. Don’t confuse the dataset in Tableau with a dataset in Power BI, both are not the same. Compare a dataset in Power BI to a tableau extract. Can you combine multiple Tableau extracts to create a dashboard? Not that I know of. On top, where Power BI shines is – you can connect to a dataset that is published in the Service from the Power BI Desktop, something that Tableau can’t. This is what really causes more dependence on IT or lot of anticipation when designing datasets as you can’t reuse the work someone else already did. 4) Finally we have a point both of us agree on :). True, Power BI can not create new columns/measures from the browser. That said, Power BI desktop is free, so anyone can download the same report and edit in Power BI Desktop at no extra cost. Also, this (as well as the data preparation functionalities) would be editable in the browser soon, it is in the roadmap. Exporting to pdf – Already there. Click on Print and select Print to Pdf. Bottom line, I feel the vast majority of your points are wrong, and you don’t need to have Microsoft infrastructure. There is always additional capabilities if you do have, because it plays really well with the other tools. Regardless of whether you have MS infra or not, it is going to be cheaper in the vast majority (not all as I have mentioned above) of the cases. I’m enjoying this conversation Jason – but I have been in many like this before and they always end in a boring way. I can’t help thinking we should work together to create something that is REALLY useful to help people decide the solution that suits them (even more useful that your very useful post). Here’s an idea… Every year, Gartner run a ‘Bake off’ – I’m sure you’ll be aware of it. Each of the companies at the top of their MQ create something to show off their products… It’s a bit sterile imo though – I think we can do better. How about we arrange an un-official bake off, 5 power bi users, 5 tableau users (hey, we could even invite Qlik), unknown data sets and 30 minutes (we could also run a second one with 8 hours to simulate more realistic business conditions). We would be able to web cast the thing to 1000’s and video it to be watched by 1000’s more. We could even repeat it annually to see how the products develop over time as Gartner do. We’d clearly have to set it to music in the style of a 1970s dance off. I am in, and we can definitely discuss that. We should split it into 2 parts though – what is possible just using the tools themselves + what is possible by integrating with other tools. That will give an apples-to-apples comparison as most of the times, we only compare the price of Tableau vs Power BI (no other tool included). Thanks for taking the time to do this analysis. Working at an organization with both Power BI and Tableau, we’ve tried our hand at this same type of write-up many times, but it’s just been too hard to maintain at the rapid pace of change. Like you stated, Excel users (basically everyone) are quick to jump into Power BI. It feels like Excel. However, as an analytics educator, what I find is that our users often hit a wall once they want to move beyond importing an excel sheet and using quick-measures. While DAX can look like Excel syntax, it often is complex and not intuitive. Tableau’s years of refinement on their user experience and focus on keeping you “in the flow” really shines with this audience that has gotten their introduction to data visualization in Power BI. In most cases, it seems like Power BI is selected for the cost, but often ends up as the gateway to more powerful analysis in Tableau. I would say – it depends. I come from a consulting background too, and have worked extensively across both the tools. And don’t take me wrong, I love both the tools and if at all you see that I am answering a lot of questions on Power BI, it is because most of the rumors are also surrounding Power BI. I have worked with many of the Fortune 500 companies, and also in my current capacity, work with 130 accounts (and countless business groups). I have seen people taking to Power BI like a fish to the water. I have seen it with Tableau too. I have seen many Tableau people converting to Power BI and loving it (and the reverse also). You say DAX is hard. Well, I have seen people say the same thing about LoD calcs in tableau. Instead of generalizing, pick up specific examples. E.g., YTD Sales in Tableau = IF [Order Date] < = [reference date] AND DATEDIFF('year',[Order Date],[reference date])= 0 THEN [Sales] END YTD Sales in Power BI = TOTALYTD(sum(Sales[Sales]),'Date'[Order Date]) Note that you don't even need to put a reference date (which would be a slicer/filter). But if you were going to say, you would rather do that in the Table calculations in Tableau (https://community.tableau.com/docs/DOC-5273), Power BI also has quick measures for YTD – (https://docs.microsoft.com/en-us/power-bi/desktop-quick-measures), and would be just a couple of clicks. I just wanted to write a calculation so that you can see the difference. Compare equivalents instead of saying DAX is hard or Tableau calcs are hard, generic statements are what generates rumors. I’m not sure these two calculation comparisons are completely fair. TOTALYTD is shorter, however, this example requires a separate Date table (and a relationship to be created). Also it doesn’t work in Direct Query mode as far as I’m aware. I do agree with your point about LoD calcs in Tableau – they take a bit of time to understand – especially if you don’t have a background in Business Intelligence. You don’t need to write a formula or add a calendar table or a relationship in Power BI to get a YTD formula. You just select quick measures, select the date column and the base numeric column and it works. I’ll second everyone that appreciates the effort in putting this article together. I’m actually an analytics educator, consultant, and manager of a professional services team myself. I use both Power BI and Tableau on a day-to-day basis, plus I teach them, and run projects from small to massive enterprise implementations of both. All this to simply indicate my viewpoint isn’t from someone that picked up either tool last month and is espousing an opinion. I agree with Mitchell. One of the single biggest roadblocks I’ve seen in Power BI adoption is DAX. There are some minor irritants, like taking three or four mouse clicks in Power BI to do the same thing Tableau does in one, but DAX is where many of our clients start having the conversation with my company about switching. In my personal experience with all of our analytics clients, Power BI is usually still a centralized tool of IT or the analytics power users. It’s rarely used by non-analysts with most clients I work with. On the other hand, Tableau is used by pretty much anyone that can use a mouse… And we routinely see Tableau installed for all types of users, and even see that they continue to use it, not just try it once and lose interest. And I’m ONLY referring to visual creation with the “anyone with a mouse” piece… I’m not referring to the data source creation process. That is still a much more technical exercise to do correctly in either Tableau or Power BI. And while your YTD calculation example between Power BI and Tableau is valid, you only have to know a half dozen date functions in Tableau. Whereas in Power BI there are dozens of specialized date functions. So Power BI makes specific computational situations easier on a per-function basis, but ends up creating a much wider body of functions a person needs to know to be proficient or excel in the long run. But even more of an issue for me is the implementation of visual cognitive theory and visual best practices. I’ve studied and teach visual best practices on a regular basis and fancy myself an expert in what works best in imparting visual information to the human brain with little cognitive effort. In this area I find Tableau delivers this out of the box. In fact Tableau is rather draconian about enforcing it in some situations (can you say, “word cloud”). So users are able to deliver perceptually intuitive visuals without having to think about it. Not to say Tableau users can’t mess visuals up and create some truly sad, non-best practice visuals that go completely against visual cognitive theory, but with no formal training, and using out of the box capabilities, a neophyte Tableau user will deliver more best practice visuals than neophyte Power BI users. Also, wish me luck… I’m doing a similar exercise myself right now. An article comparing the two tools/platforms. However, to avoid the “my article is 6 months old and no longer current” I’m creating a database of differences between the two with dates they were last reviewed and a weighting system to reduce impact of “old” differences (which will give Power BI a leg up). All this to create an interactive comparison visual between the two where you can define priorities of capabilities and have the algorithm compute most useful information for you to be aware of when comparing the two. Quite a lot of work. Especially with all the biased articles you referred to early in your article. There are so many biased articles it takes effort to weed through the bias to get the nuggets of objective differentiation. In any event, thanks for putting this together. Oh, and I couldn’t agree more on that Tableau TCO article. A shining example of how paying someone to come to a conclusion you want them to arrive at is so distasteful. Please do share here if you complete it. Great post Jason. Thanks for the effort in pulling this together. As suggested, I have a couple of comments for your consideration. In your point 1, my view is that Power BI data prep first started with Power Pivot around 2010/2011.. Power query came much later, maybe 2013 or so. I think there is another important concept that Tableau won’t talk about that could be refered to as “Total cost of Lack of Use”. You touch in this in your TCO section, but I think it deserves its own important heading. The cost of purchasing a solution that people do not use and embrace is the most expensive mistake any company can make. Many people just prefer using Excel compared to learning a new tool. Microsoft is leveraging their natural advantage with their “Power Bi and Excel – better together” approach while building Power BI with this in mind. While there is a learning curve of 1-2 days’ effort for most good Excel users to pick up Power BI, my experience is then they are off and running with a tool they want to learn and use. I have seen lots of Enterprise BI solutions that are just expensive “export to Excel” systems. Regarding the data preparation skills, there was some basic data preparation abilities in Power Pivot but that would not be in the same league as Power Query (you can compare it to what Tableau has now for data preparation, simple joins, pivoting, etc.). What Power BI has now is amazing, it is a pity that many are still not aware of the data prep functionalities, as they get fixated on the data visualization. Great point regarding the “Total cost of lack of use” and the “better together” story. That said, Tableau is one of the few tools that I have seen where the actual usage is high. thanks for the post, just to be clear, I love and use PowerBI, but in my previous job we end up using Tableau instead of PowerBI, the combination of Tableau and Tableau reader was the cheapest option in our case, we were not ready for the cloud, just for cultural reason, deploying PowerBI server was too expensive, although initially we kept exchanging pbix files, works relatively well, until the manager wants to print his reports, which is not possible and he did not like really doing screenshots, the other hurdle was, he could not copy and past values to Excel. Great article. Might be worth mentioning that Power BI Report Server is free as part of SQL Server EE with SA, but only if you purchased a CORE-based license. If you purchased a SERVER-based license then it isn’t free, and you need to buy Power BI Premium in the cloud and then you get Power BI Report Server up to the same amount of cores as part of that deal. Great effort Jason – thanks! I wonder if you would consider adding a re-calc of that dodgy TCO table, but putting in your best estimate on the correct $ ? Another copy of that on a smaller scale (e.g. 100 users total) would also be helpful. I love both Power BI and Tableau. Been using Power BI since its inception. Became aware of Power BI while working with Power Query and Power Pivot. I agree that Power BI continues to close the gap to Tableau. I have always been the biggest fan of Power Query/Query Editor. But because of many significant limitations of Power BI, I still fall back on Tableau. I use “Power Query and Tableau” to build proof of concepts, and I use “Alteryx and Tableau” for Production level big data projects. In general, I can do just about anything I can imagine with Tableau, but it can be very difficult to build it. Whereas with Power BI, I can “almost” achieve a lot, but never meet my requirements based on Power BI’s limitations and technical shortcomings. In a previous note, SQLJason suggested using specific examples. Last year, Power BI made me ecstatic with joy with the release of the waterfall chart, with breakdowns. With Power BI, I can build a good waterfall chart in minutes, but it does not meet my requirements, due to limitations in sorting and dynamic axis scaling. In Tableau, it takes me about an hour to build a waterfall chart that meets every single one of my requirements. But it is hard to build. But once I build it once, I can easily apply it to other data sets. 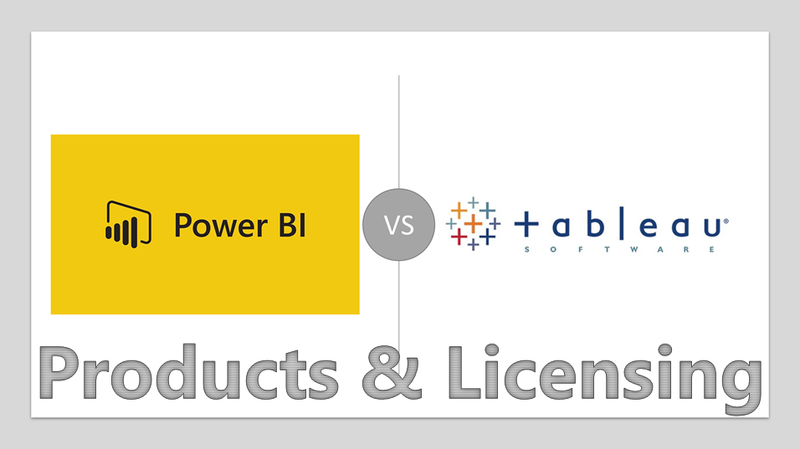 I’ve been working with both products for about the same amount of time – 2-3 years; always feeling that I would soon be able to make the jump to Power BI; But time after time Power BI falls short of my requirements. With all that said, for the average BI user, I recommend Power BI, for the power user, or someone working with big data or sophisticated visuals, I recommend Tableau. Hi SQLJason, You mentioned that there is a “free Power BI service”. Is that new? I’m interested in learning more. I am only aware of a “back door” method to get Power BI Service for free, and I don’t believe I can share reports with anyone through that method. Not clear how you got to $628,890 for Power BI. Can you tell us what all is in that number? I estimate it’ll be about $90K/Yr before discounts for that, but that’s Desktops and cloud only with a Data Gateway server. 197 Pro=$23,640/Yr and a P1 Node= $60,000/Yr plus about $6k to run a Data Gateway Windows server. So, you must be including On-premise and other stuff in your numbers? You and I are on the same page. The figure is from the Tableau TCO whitepaper, which I feel is nonsense. So the pricing structure and the comparison table you made in your post will need to reflect the new Tableau pricing as released in past couple of weeks ? Or that tables has been updated and is reflective of that ? CAn you please advise ? Also, whats the limit of the datapoint on visual map for tableau ?? if its 10,000 for PowerBI ? One Major roadblock we faced is on the Adoption and migration of Tableau content to Power BI. As Power BI Recommendation is to roll out content via Apps to end users. Tableau has a site -> Project -> Workbook -> Views approach.I can maintain multiple projects of different nature within the same site and manage user permissions at the project level. I can also keep row level security at the DB level. When it comes to Power BI, this is slightly different Workspace (App/Premium Workspace) -> Dashboards/Reports/Dashboards -> Apps. If I have a Tableau site with 50 projects and I may need to replicate in Power BI using 50 workspaces and roll them into users as 50 Apps. The admin interface is still evolving and is a way behind compared to Tableau. Thank you so much for putting the effort to write this awesome article! Is it possible to do a comparison between Power BI and QliK Sense? Same question. Qlik sales provides a “TCO” document that shows a much higher cost for power bi. Smells fishy to me. Thank you so much for this comparison! Is it possible to do a comparison between Power BI and MicroStrategy?